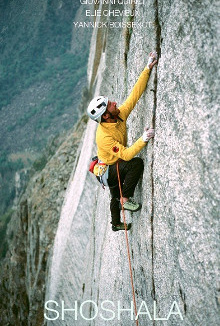 Last year (2010), during a bouldering trip, Elie Chevieux found a big wall in Baspa Valley. He decided to go back this year with Giovanni Quirici and Yannick Boissenot to open a new route on this virgin summit : “The Shoshala”. After 2 months in India, 3 weeks at the base camp with only 3 sunny days, they opened a 2,300-foot route with many pitches in the 7th degree and reached the summit, standing at 15,400 feet. It was the last expedition of Giovanni Quirici.